It's time to celebrate! .... Not just my niece's birthday but also the start of Sale-A-Bration 2018 and the launch of the new Occasions Catalogue! These little guys are just so cute! And quite versatile - use them individually or together and adjust the backgrounds and greetings to suit many occasions and age groups. The Painted With Love paper is sooo stunning it makes any card really special with no effort! This trio are in full on party mode for my niece's 18th! The Painted with Love papers are just so stunning that they make any card really special, quite effortlessly! I cut the balloons from a different piece of the paper (you can see more of it in this card) and tried to use the markings in the paper for some shadows and highlights. I drew in the strings with a Basic Black Stampin' Write Marker. The numbers are stamped with Melon Mambo ink using the Back to Basics Alphabet stamp set which is, unfortunately, retired but the numbers were just the right size!. The watercoloured "dance floor" is a bit of a happy accident! I started out with Powder Pink, darker in the foreground, then added some Melon Mambo shadows. The blue was an accident but I rather like it! I had just finished using Brusho crystals and water to watercolour a sky and clearly hadn't washed my brush as thoroughly as I thought I had! 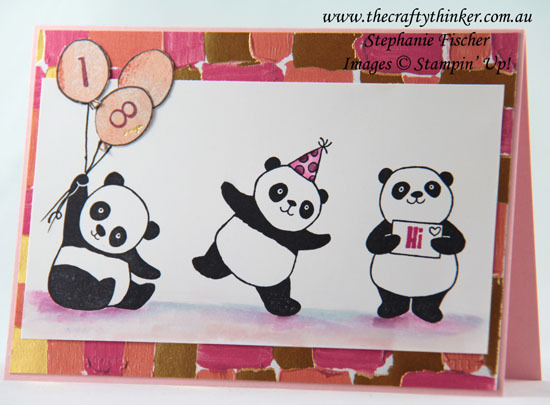 Both the Painted With Love Specialty Designer Series Paper and the Party Pandas stamp set became available today! 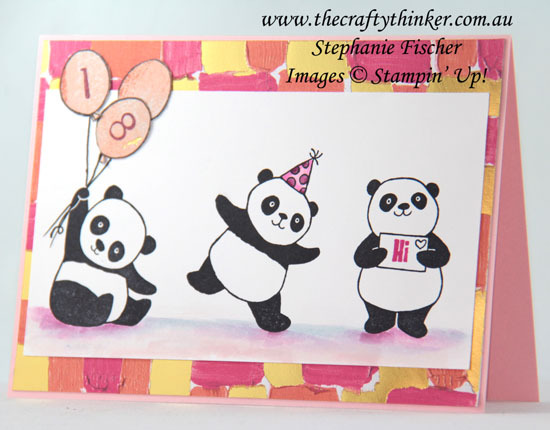 The Party Pandas are one of the amazing items in the Sale-A-Bration Catalogue and are FREE with an order of $90. Contact me if you'd like more information about the incredible Sale-A-Bration offers and opportunities.